Components used in the construction of this guitar. 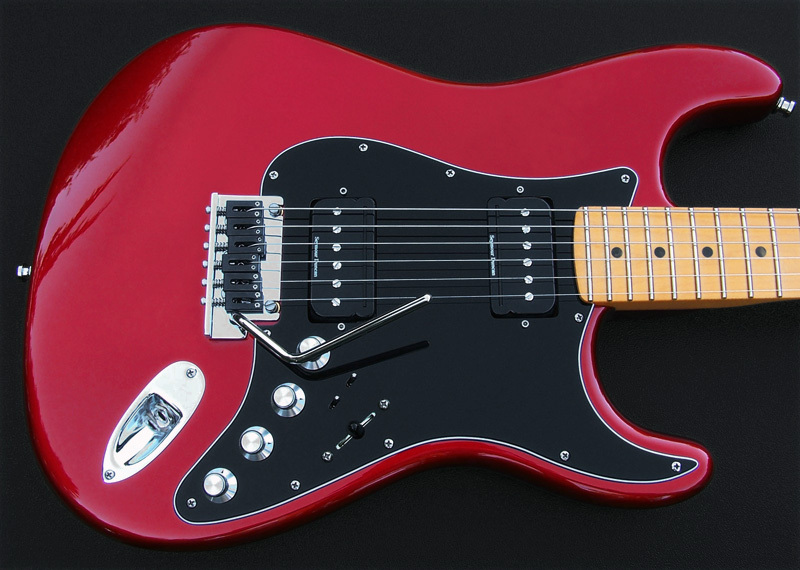 2012 American Deluxe Strat®, Candy Apple Red. Compound Radius 9.5" to 14" Maple Neck, Medium Jumbo Frets, Locking Tuners. KGC Brass Mega Mass Tremolo Block, KGC Brass (Chromed) Bridge Top Plate, KGC Brass Tremolo Claw and Graph-Tech String Saver Saddles. Custom Manufactured "Drop-Trem" Style Push-In Tremolo Arm. Bridge Pickup: 0.045 uF Sprague Polyester Film Orange Drop Capacitor. Neck Pickup: 0.044 uF Sprague Polyester Film Orange Drop Capacitor. 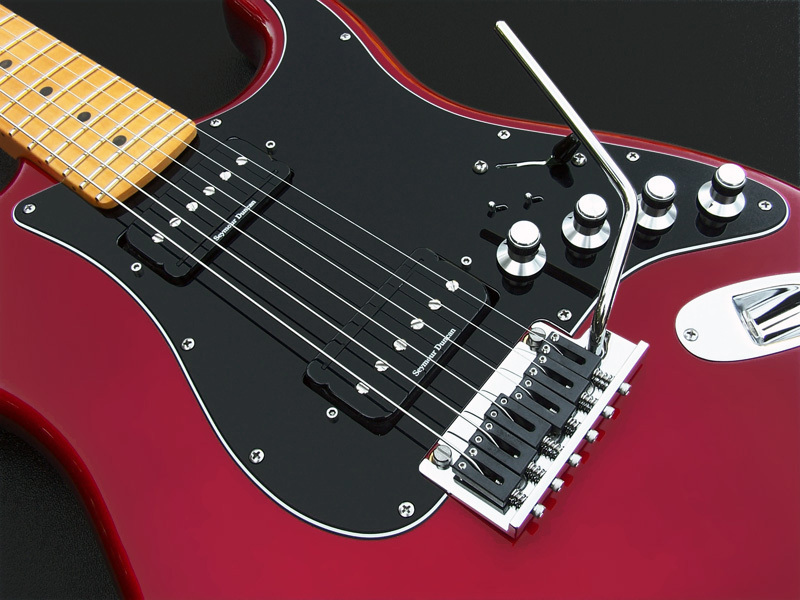 There is a separate volume and separate tone control for each pickup. 4 x Bourns Model 95 Premium 500k Potentiometers w/Custom Machined Aluminum Control Knobs. 2 x DPDT Mini-Toggle Switches. 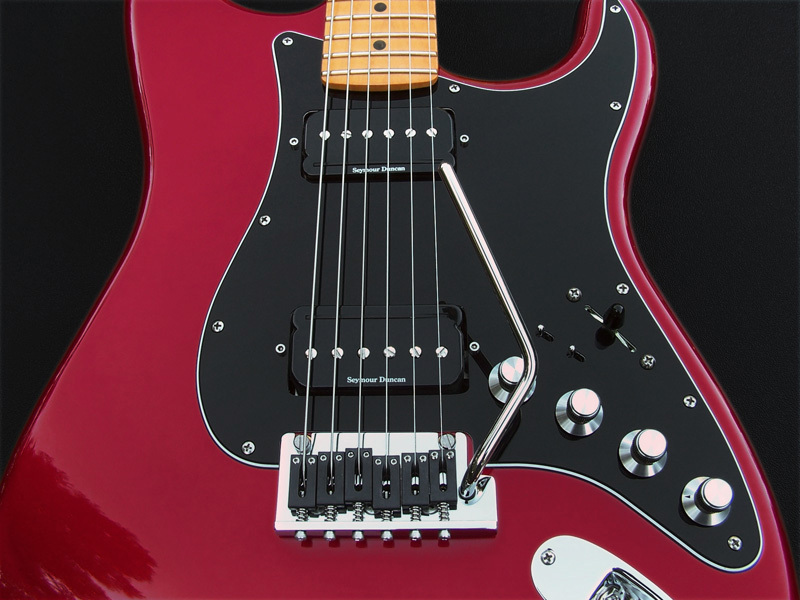 With the combination of a 3-way selector switch and two DPDT mini-toggle switches there is a total of 12 unique pickup selection options. 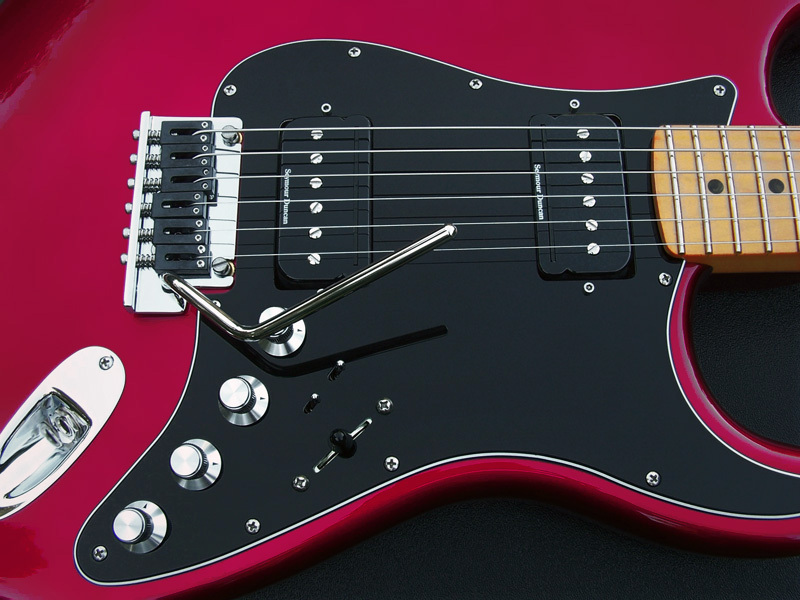 The way each of these P-Rails pickups are designed as a matched set where you have a designated bridge and designated neck pickup and when each pickup is split for either P-90 tone or single coil (Rails) tone and the bridge and neck pickups are selected together with the 3-way selector switch (middle position) hum cancelling is achieved. This is because the bridge pickups coils are wound the opposite direction as the neck pickups coils and they are also opposite polarity, which in effect creates a wide spaced Humbucker. The 3-way selector switch performs a typical Gibson style pickup switching with 3 selections; Bridge pickup selected, Neck pickup selected or both pickups selected together. These 3 basic pickup selections combined with the four selections below create the 12 unique total pickup selections. 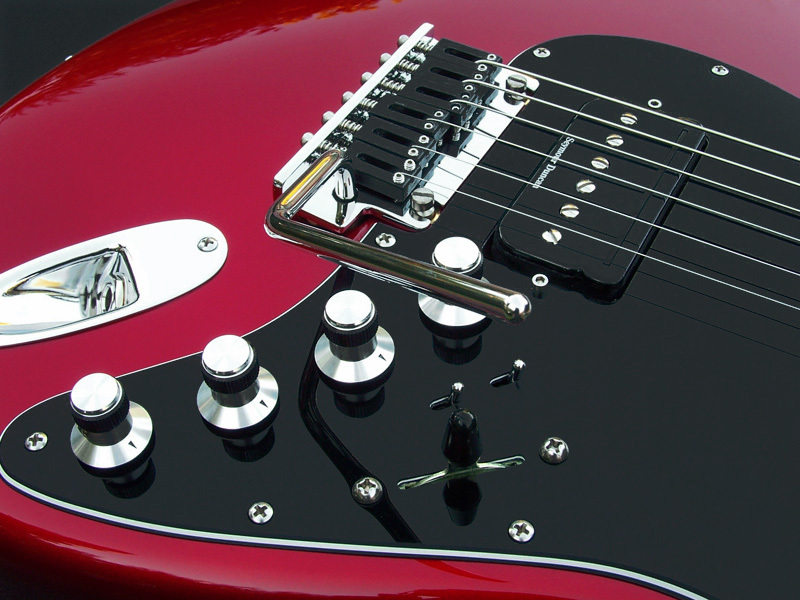 Series connection between the P-90 coil and the Rails coil of each pickup to provide a typical Humbucker tone, full output with hum cancelling. Parallel connection between the P-90 coil and the Rails coil of each pickup to provide a lower output tone with hum cancelling. Rails portion of each pickup selected, P-90 portion off. This is single coil pickup tone. P-90 portion of each pickup selected, Rails portion off. This is P-90 pickup tone.